Once you have explored everything the Rapid City area has to offer, you will head South to explore Wind Cave National Park before heading West towards Devil’s Tower National Monument. Devil’s Tower is a great place to catch a breather before you head further West into the Rocky Mountains and Yellowstone and the Grand Teton National Parks. Located only a few hours apart, you will want to spend at least two or three days exploring these parks and the surrounding area. After exploring the greater Yellowstone region, you will head South into Colorado and some of the magnificent parks that it has to offer. The first stop will be Rocky Mountain National Park, where you will get to see the grandeur of the Rocky Mountains. Upon heading further South, you will get to check out the Black Canyon of the Gunnison and Great Sand Dunes National Park, which are some of the most underrated parks in the US National Parks System. Finally, you will head North to Denver, Colorado where your trip will conclude. But not after having visited the heart of the US National Park System and seen some of the most beautiful landscapes in the United States. This trip involves roughly 34 hours of driving, which can be chopped up into manageable sections of daily driving if you spread the trip out over a few weeks. I have laid out an itinerary for a 12-day trip below, but if you have a few extra days to spare you can choose to spend some additional time at one or more parks. You will arrive in Rapid City, South Dakota and rent a car. When you book your flight, make sure you choose a multi-destination ticket. You will be flying into Rapid City, but you will be flying home from Denver, Colorado. The same thing applies to your car rental. Make sure you specify Rapid City as the pick-up location, but Denver, Colorado as the drop-off destination. The Badlands is the start of the Rocky Mountains and are as unique and beautiful as the mountains themselves. You will see some pretty amazing rock formations and forests in the park that are definitely worthy of exploring. Mount Rushmore probably needs little introduction, but if you aren’t familiar with this national memorial, it is a large carving of several former US presidents into the rocks of the Badlands near Rapid City, South Dakota. Devil’s Tower National Monument is a unique and interesting geologically formed rock formation that was prominently featured in the movie “Close Encounters of the 3rd Kind”. After reaching the Rocky Mountains, you will spend your first chunk of time exploring Yellowstone National Park, which was the world’s first national park. You will get to see the amazing geysers, hot springs, canyons, waterfalls, and wildlife in this amazing national park. When you have finished exploring Yellowstone National Park, you will travel just South of Yellowstone to visit its sister park and one of America’s most beautiful mountain ranges, the Grand Tetons. The Grand Tetons have been called the Alps of the United States because of their beauty and Grand Teton National Park has some of the most stunning mountain vistas in the US National Parks System. Once you have finished exploring the Yellowstone and Grand Teton National Parks, it will be time to head South into Colorado. The first national park you will explore in Colorado is the Rocky Mountain National Park. With some of the most majestic mountain passes in the Southern Rocky Mountains, Rocky Mountain National Park is breathtakingly beautiful. Take a few days to explore this park and all of the activities it has to offer before heading further South to see some of Colorado’s other parks. The next park you will visit in Colorado is arguably the least known national park in Colorado. The Black Canyon of the Gunnison is a beautiful canyon that is home to some of North America’s most renown predatory birds. If you are into beautiful viewpoints and bird watching, then this park has the perfect mix of those two things for you to enjoy. The final national park in Colorado that you will explore is the Great Sand Dunes National Park. For those who have always wanted to climb enormous sand dunes, then you will be thrilled with this national park. Home of some of the biggest sand dunes in North America, which in many aspects rival the dunes you see in some of this world’s great deserts, the Great Sand Dunes National Park is an absolutely amazing landscape that you need to see to believe. 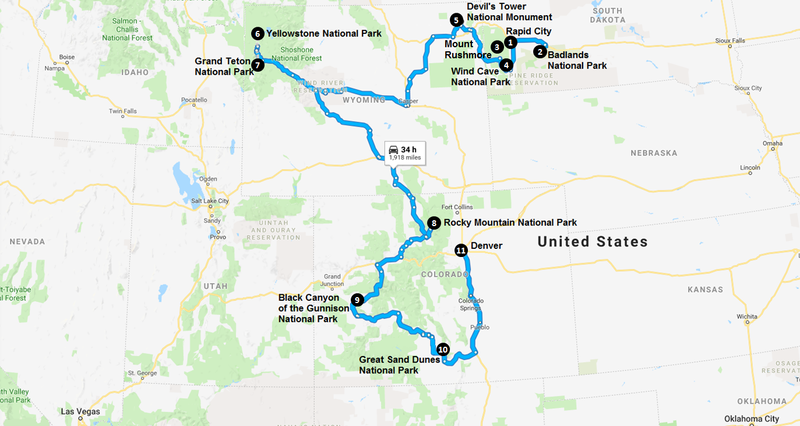 Your trip will end with a drive North from the Great Sand Dunes National Park up to Denver, Colorado. Here, you will return your car rental and catch your flight home. If you have some extra time to spare, Denver is an amazing city with a lot to see and do. I would strongly recommend spending a few days to explore Denver if you have the time. This trip is amazing year-round, but I would strongly suggest that you take this trip in the summer months (Jule thru September). You will likely see larger crowds then, but the weather will be much more moderate. It can get really cold in the Rocky Mountains during the winter months and the weather during the spring is rather unpredictable. You will be traveling thru some roads at high altitude on this trip and it can be rather dangerous during heavy snowfall.